Habeas corpus is a legal action in which a prisoner challenges the authority of the jail or prison to continue holding him. This Latin term translates as, “you have the body,” and it allows incarcerated people to seek relief from unlawful confinement. Habeas corpus is a protection against illegal imprisonment, afforded to United States citizens as outlined in the Suspension Clause of the U.S. Constitution. To explore this concept, consider the following habeas corpus definition. Noun A court order that requires a person, usually a prisoner, to be brought before a judge to decide whether he is being held legally, or should be released. Habeas corpus is the belief or concept that citizens of the United States should be free from the fear of being illegally detained or imprisoned. 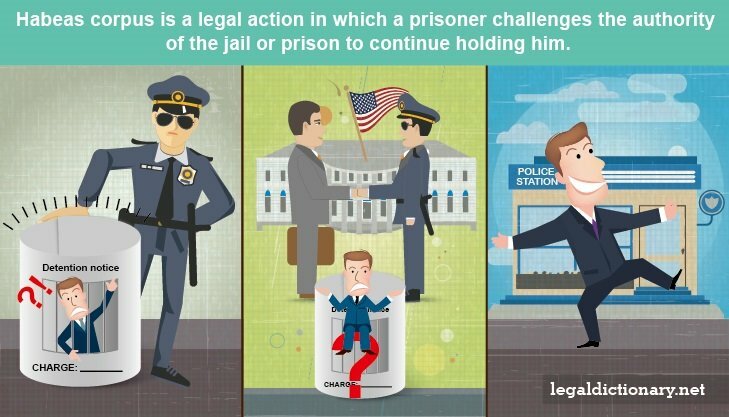 In the U.S., individuals being held may ask the court to order the jailer, warden, or other party holding the individual to prove the legality of his arrest and imprisonment. If the court finds the warden or other custodian has no legal justification to hold the prisoner, it may order his release. The concept of habeas corpus dates back to 14th century England. It was first expressed in the Magna Charta of 1215, which stated, “No free man shall be seized, or imprisoned, or disseized, or outlawed, or exiled, or injured in any way, nor will we enter on him or send against him except by the lawful judgment of his peers, or by the law of the land.” The philosophy made its way into English common law in the 1300s, and eventually, common law courts began to issue writs of habeas corpus to order the release of people held by royal courts. This principal traveled with the colonists to early America, where it evolved to the modern principal held dear by American citizens, that no person shall be deprived of freedom without due process of law. The writ was issued by American colonial courts and state governments continued to recognize habeas corpus as a natural right. In 1789, the Judiciary Act granted federal courts the authority to issue the writs to detainees in federal custody. However, the same courts could not issue the writ for state or local prisoners. Additionally, the Supreme Court held, in 1807, that federal courts had no authority of habeas corpus over prisoners held by state or local governments, as Congress had not given it that authority. This oversight was corrected by Congress in 1833, with the enactment of the Force Bill. The principle and application of habeas corpus continued to evolve and, in 1867, the writ was made available to anyone deprived of his liberty in violation of the U.S. Constitution. For the first time in history, writs of habeas corpus became a remedy for individuals already convicted. In 17th century England, the sovereignty’s ability to arrest and hold in prison anyone for any reason became a point of contention in Parliament. During the reign of King Charles in England, Parliament eventually succeeded in addressing the issue with the enactment of the Habeas Corpus Act of 1679. The Habeas Corpus Act was a procedural device that allowed the courts to review the facts, and determine whether or not the prisoner’s detention was lawful. The intention of the Habeas Corpus Act was to protect the liberties of citizens, preventing them from being imprisoned indefinitely without just cause. The Act became one of the most important statues in English history, as it protected the rights of individual citizens. There have been several acts passed since the Habeas corpus Act of 1679, but none has had the far-reaching impact of that first legislation. A writ of habeas corpus is a petition filed with the court when a prisoner wishes to contest the legality of his imprisonment. Most frequently, a writ of habeas corpus is used as a post-conviction remedy when a person believes laws were illegally applied during the judicial proceedings that resulted in his detention. The writ is also used for military detention purposes, as well as in immigration and deportation matters. Prepare the Petition. The petition is generally filed pro se, meaning the prisoner files the petition without the help of a lawyer. The petition must include certain information, such as the facts of the case, and why the prisoner feels he is being detained illegally. The petition must be in writing and signed by the prisoner or his attorney. File the Petition. After the petition is written up, it must be filed with the court. This can be done by mail, online, or in person. There is a filing fee associated with a habeas corpus petition, but that fee may be waived if the prisoner provides an affidavit that he cannot afford to pay it. Serve the Petition. After the petition has been filed with the court, it must be served on the person or facility that has custody of the prisoner. If the prisoner is in a state prison, the petition is served on the state attorney general. Service by a qualified process server ensures the custodian is notified of the prisoner’s claim, and specifies whether the recipient is required to provide a response. Consideration of the Petition. After the petition has been properly served, a judge is assigned to the case to examine it, and to determine whether or not it meets the requirements for a writ to be issued. Dismissal or Award of Writ. After the judge has reviewed the habeas corpus petition, reviewing pertinent evidence and supporting documents, he will make a judicial decision whether to issue a writ of habeas corpus. If a writ is issued, a date for a hearing is set. The Hearing. At the hearing, both the prisoner and the custodian or prosecutor will have the opportunity to present their arguments, evidence, and witness testimony. At the conclusion of such a hearing, the judge will issue a judicial decision as to whether or not the individual is being held lawfully, or if he should be released from custody. Appeal. If the writ is denied, the prisoner can file an appeal. The state can do the same if the writ is approved by the court. John was charged with domestic abuse. Mary, John’s victim, was too afraid to testify against him. During the hearing, the evidence presented was mainly hearsay testimony from a police officer that had spoken to Mary after the assault took place. A year after John was convicted and sentenced to prison, the Supreme Court ruled, in the case of Crawford v Washington that hearsay statements of witnesses that refuse to testify in court are not admissible in a criminal case. John then filed a habeas corpus petition, asking the court to overturn the conviction based on the Supreme Court’s decision. Pro se – A party to a legal action acting without legal counsel. Warden – An individual responsible for the care or custody of people, as in the chief administrator in charge of a prison. Writ – A written order from a court or other legal authority. I have a question about an inmate being held he was sentenced 18years and is eligible for parole in 2028 but the courts have no physical proof of his crime other than testimony can you please help. Is there anything that can done? ?